Feiyues are very good sneakers for practicing Kung Fu. I often recommend them to my students and friends. They are light weight, low sneakers with good grip. And they look fashionable, good summer shoes! I train everyday in Feiyues outside. When they get dirty I wash them. 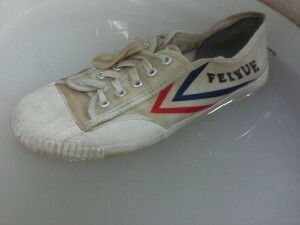 And when they are damaged after time, I simply order a new pair of Feiyue sneakers. My favorite color is white. The black and white version is the traditional one from Shanghai. Feiyue is introducing new lines also with low and mid low to high sneakers with different colors. Do you also wear Feiyues?? And what is your experience with these martial arts sneakers?